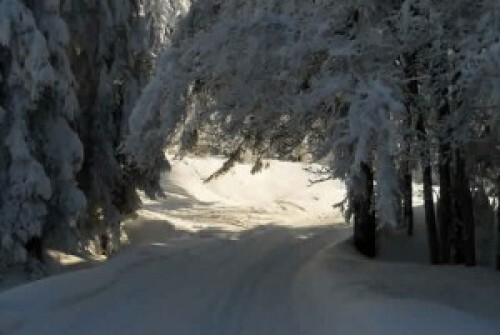 This is a beautiful picture of the bottom of the ski back route to the following chalets: Hastings, Senlac, Panda and Chavannes. Gizzie and I went along the Nabor Road today and I found this enormous stick. It was -14 degrees out; the humans all put extra layers of clothes on, but we didn't mind it and even enjoyed rolling around in the white stuff. These pictures were taken a few days ago, two were taken from close to the top of the Chavannes Express lift, looking down and one from close to the bottom of the Les Folliets lift - a little later. There was a band of mist which was moving up and down - mid afternoon it was very misty as you skid down, later on the mist moved up and it was clear below and misty above. Yesterday we went skiing in the afternoon, it was snowing heavily and the slopes looked excellent. 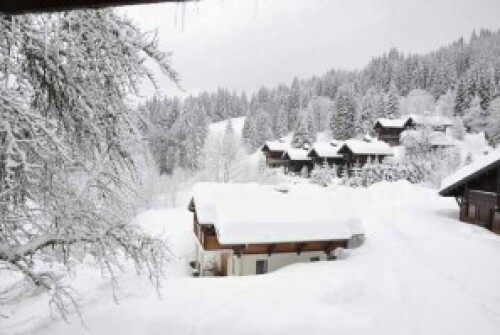 When we were walking up the Chavannes Road when, a Frenchman came out of his Chalet for a chat - he was saying how bad the weather was and assumed we were coming back from skiing. He was amazed when we said that we were just on our way out - but then we explained we are English! 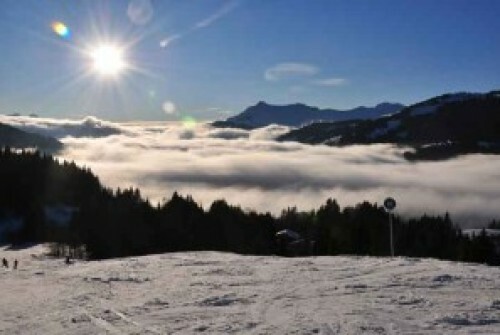 Chalets1066 have some amazing last-minute offers for ski holidays in Les Gets, full details are on the 'deals' page of the web site. With the snow being so very good, everywhere is starting to sell out. Chalets1066 simply want to fill up. Hi - I'm Harry [tall and handsome] And hello from Gizzie (smaller and fluffy). Been here since December and our verdict - Les Gets and Hastings are awesome. It's snowing! 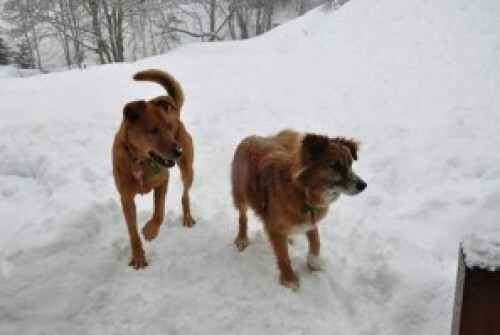 After weeks of sunny skies and snowdrifts that white stuff is coming down from the skies again. 35 more cm last night...how much deeper can it get? We already work hard, struggling through the snow, chasing the odd marmotte. Will we ever catch one? We have a wonderful view from the office at Chalet Hastings. We feel so privileged to be able to look out and see such beauty. 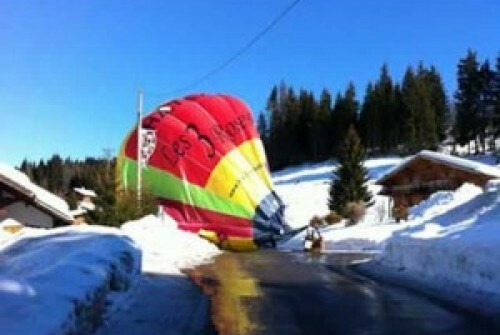 This photograph was taken just over a week ago, after a snow fall. 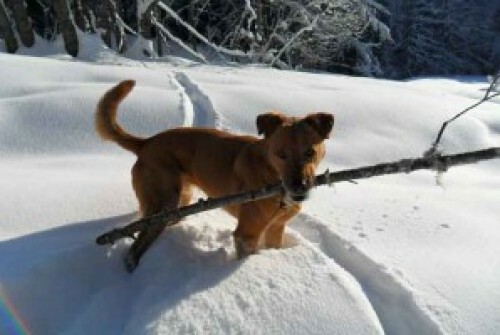 I hear that 81 cm is now forecast for Les Gets over the next three days! The amount of snow has been excellent this season, however, the work involved in snow clearing so far this season, has been quite exceptional, Jeff and Dirk are really appreciated for the outstanding hard work they have done, it is impossible to plan ahead for large amounts of snow and we are reliant on support and commitment to ensure the snow is cleared. 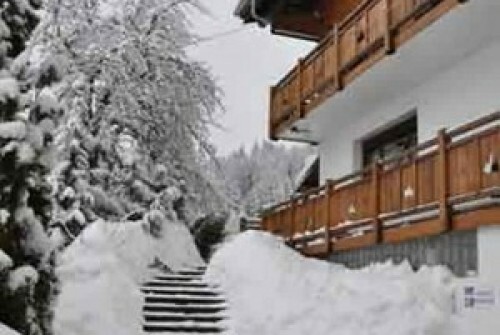 Many chalets simply are not cleared properly and the result is that the snow builds up more and more and it becomes almost impossible to get to the front door. The picture below shows the entrance to the Hastings building - you can see their work - and another 32cm snow is forecast over the next few days. 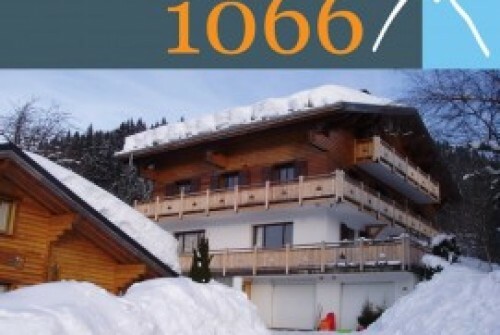 Chalets1066 are offering 20% discount on Wessex and Bayeux, where available for the rest of the 2012 ski season. Wessex and Bayeux represent, arguably, the best value for money accommodation in Les Gets for groups of 7 to 10. Both apartments are very spacious, have 4 large bedrooms (no bunk beds) and log fires. There is also a sauna, DVD library and PC/Internet. Bayeux and Wessex are in the Hastings Chalet, which currently is ski back, 10 minutes walk to the ski lifts in ski boots and the free bus stops right outside.